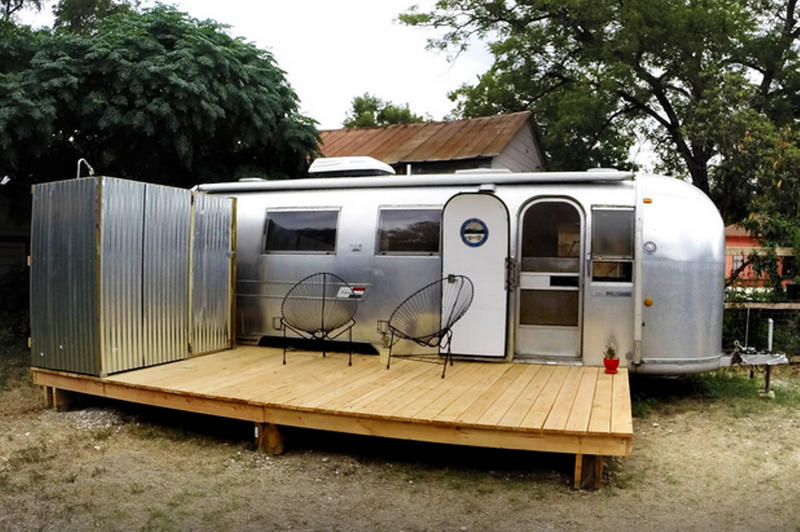 Renovated Airstream in the heart of Southtown, next to many bars/restaurants. Walking distance from downtown, Convention Center, and Alamodome. Furnished with kitchenette, full size lavatory, outdoor shower, queen bed, futon couch, and new AC + heat. Historic 1930's home! Tower and Alamodome views from porch! Enjoy a nice walk into downtown San Antonio and the Riverwalk or take a short drive to sea world. Sleeps 4 comfortably. Washer, dryer, cable and wireless internet included. Newly renovated! Located in San Antonio's historical midtown neighborhood, our well-appointed 1910 three-story home's guesthouse is private, comfortable and conveniently located within one and a half (1.5) miles walking distance to the city center and the river walk. Our Southtown home is smack dab in the middle of the best that San Antonio has to offer! We're just a 5 minute bike ride or a scenic 20 minute walk to downtown, with the historic King William district, Bluestar Arts complex, and South Flores nearby. This classic 1940 bungalow with modern upgrades is in a perfect location for travelers. No rental car needed to enjoy all the major San Antonio sights and destinations. Just a few miles from the Alamo, Riverwalk, and downtown! Minimalist Art Deco Private bedroom inside our urban home. Centrally located 2 blocks from Blue Star Art Complex, La Tuna, and Uncommon Fair natural food market. Enjoy industrial neighborhood, chef owned restaurants, & easy access to major bus routes. Remodeled guest quarter with lots of charm. Located 5 minutes from downtown. A thoughtful design of contemporary detail dovetailed with bungalow nirvana. This space has the comfort and necessity essential for a memorable and inspired stay in the pulse of King William. Easy stroll to the river, Blue Star and downtown. Secluded, stylish apt in King William/Southtown. This house is full of old-world charm with a few modern adaptations. Great central location, minutes from downtown. Easy access to I-10 will get you to La Cantera, Six Flags, and The Rim in 15-20 minutes. I know all the places to go, so just ask! Situated on 10 beautiful acres, you will wake up to peacocks and deer in the front yard. There is an event venue on the front part of the property but the Cottage is private. Just 10 minutes to downtown Helotes and 25 minutes to San Antonio! Welcome to our recently built apartment adjacent to our private home - a renovated Craftsman style house from the 1920s! This modern apartment is located just a few blocks from San Antonios hottest new area  the Pearl Brewery and the River Walk! Historic Carriage House in S.A.
Eclectic three bedroom carriage house in the historic Monte Vista area. Very near downtown San Antonio, SACC, Trinity University,the new Pearl Brewery and the Museum Reach Riverwalk. Walk, bike, relax and enjoy the "real" & hidden San Antonio. My guest house is completely remodeled and feels ultra modern, yet comfortable. There are two bedrooms, two bathrooms, a full kitchen, and a great area for hanging out, watching TV, etc. Separate entrance, pool, and great outdoor space.